a series of questions about genre and categorisation. Everyone is familiar with the conventions of the Hollywood film narrative. This isn’t a reason not to study Hollywood – or to take the conventions for granted. Hollywood, as befits the dominant institution in cinema across the world, is highly dynamic and constantly evolving in terms of film narrative. However, it is often difficult to analyse the films you know best. It helps to have some distance from the films we study and one way to do this is to study some films that are ‘not Hollywood’ in order to make comparisons. Often by comparing and contrasting similar films from different systems we notice much more about them than if we looked at only one system. Tsotsi is in every way a South African story – even though the film is technically a South Africa/UK production, because some of the production finance is from the UK. (Tsotsi was made on a very small budget of less than US $3 million. Currently the worldwide box office for the film is $9.9 million.) In many ways, Tsotsi is a new kind of South African film, because it is a mainstream film that has been seen around the world (it won the Oscar for ‘Best Foreign Language Picture’ at the 2006 Academy Awards). Previously, important South African stories have been made in the country by British and American producers using British and American stars, often producing films which, apart from the setting, look much like other Hollywood films. The Republic of South Africa is unique on the continent of Africa in terms of its history, its population and its culture. The original inhabitants were largely driven out by the arrival of various groups of people speaking a variety of languages often referred to generically as ‘Bantu’ around the 5th century AD. It’s quite important to realise that southern Africa has always been a region with a diverse population – black South Africans today identify themselves as belonging to one of several ethnic and language groups, such as the Zulu of North Eastern South Africa around Johannesburg and the Xhosa in the South West around Cape Town. From the 15th century onwards, Southern Africa became the site of colonial and later imperial struggle to exploit the rich agricultural and mineral wealth of the region. The British eventually replaced the Dutch as colonial masters, but not in terms of settlement. When South Africa became an independent nation it was the Afrikaans speaking descendants of the Dutch settlers who were the political majority in the white community and through the creation of apartheid or ‘separate development’, dominated the majority black population. But because of the history of colonial exploitation, South Africa’s population is even more diverse than this history might suggest. The Dutch and the British brought first slaves and then indentured labour (a form of economic slavery) to South Africa from what is now Indonesia and India. In the Cape Region, the intermarriage of slaves and European settlers created a community of what became known in South Africa as ‘Cape Coloureds’. When apartheid ended in 1994 and South Africa held its first multi-racial elections, it became in the new President Mandela’s words, “A Rainbow Nation”. Today South Africa has a population of 47 million. The various black communities make up around 79% of the population, followed by the white community, the Cape Coloureds and the Indian/Asian communities. Because of the history outlined above, township culture has developed in distinctive ways. In the first half of the 20th century, men outnumbered women 3:1 since they were primarily workers who had left families behind and were accommodated in hostels. There were few civic amenities in the townships and social life was based on the beer hall or shabeen. Men outnumbering women generally means organised prostitution and high crime levels. But the culture also developed positive aspects, including a vibrant musical culture, combining traditional music with imported black music styles from America. Initially the influences were jazz but now it is likely to be hip-hop. Tsotsi uses the current township music culture, known as kwaito throughout the film. One of the main characters is played by Zola, a leading kwaito performer. Besides crime and music, the main way in which township residents have become famous is via sport, especially football, and the political struggle against apartheid. Not surprisingly, several South African novels, plays and films have focused on township life as the basis for their stories. Outside South Africa, the best known of these have been written by white South African liberals, sympathetic to the residents. The two best known writers in the UK are Alan Paton and Athol Fugard. Alan Paton (1903-1988) was a Christian who became a teacher and then principal of a Reform School where he instigated progressive policies. In 1953 he founded the South African Liberal Party – a multi-racial party that was later banned by the apartheid regime. In 1948 he wrote his most famous novel, Cry The Beloved Country. This was made into a British/South African film in 1951, starring the African-American actors Canada Lee and Sidney Poitier and then a South African/US film in 1995 starring James Earl Jones. Athol Fugard (b 1932) is a South African playwright who in the 1970s wrote several plays attacking the injustices of apartheid. One of these, Boesman and Lena, was adapted as a film in 1974 and seen around the world. Another, Sizwe Bansi Is Dead (1972) was performed in several countries. Tsotsi is based on a novel that Athol Fugard wrote in 1970, which has been updated to relate to a post-apartheid South Africa. Tsotsi is a relatively unusual film. Putting aside the small UK involvement, it is a South African film, made by South African talent, for both the home market and for export. It is one of a small number of such films released in the last couple of years, marking a change in South African filmmaking. In the past, filmmaking in South Africa has been split into three separate activities. Because of its range of locations and good infrastructure, South Africa has been used by many Hollywood and ‘international films’ to stand in for other parts of Africa. In such cases, directors and stars have been flown into the country and this has happened even when the story has been distinctively South African. The film Red Dust (UK/South Africa 2004) dealt with the aftermath of apartheid and the Truth and Reconciliation Commission, yet the two stars, Chiwetel Ejiofor and Hilary Swank were brought in from the UK and the US. There has always been a small-scale white South African film industry, often making local comedies and not usually exported. There has also in the past been an ‘exploitation’ film industry making films cheaply to be shown in the townships. This practice was supported with some funding by the apartheid government for a separate black cinema culture. The legacy of apartheid in terms of cinema has been a weak local industry, almost totally subservient to Hollywood. Despite having more cinemas and more admissions than anywhere else in Africa, the South African industry had little real success at home until Tsotsi. Most South African audiences have traditionally preferred Hollywood films. There are various ways of thinking about Tsotsi as a film narrative. In structural terms it is quite straightforward. Writer-director Gavin Hood even says on the DVD that it is a ‘simple’ narrative. Apart from the flashback memories of his childhood that Tsotsi himself experiences early in the film, the narrative structure is linear in terms of time. Everything takes place over four nights. There are brief sequences dealing with the investigation of the abduction of the baby by the police and Boston’s recuperation at the shabeen, but most of the time Tsotsi himself drives the narrative forward. Questions of colour, cinematography etc. The most striking feature of the film is what we might call the ‘colour palette’ with which the cinematographer is working. Most scenes take place either at night or in what appears to be a rosy glow of early morning or early evening. Few scenes are shot in the bright sunlight of mid-day. Shooting at night is always difficult and creating a coherent look for the film across the different environments and natural lighting conditions was the main aim. Tsotsi was featured in an article for American Cinematographer magazine (see Bosley 2006) so we have some good ideas about what was intended and how the effects were achieved. An expressionist image using lighting to emphasise the state of Tsotsi with the baby in his shack. Director Gavin Hood believed that Tsotsi was essentially an ‘internal story’. Although there are several action sequences, the real story is inside Tsotsi’s head. Ideally we should study Tsotsi and understand how he is beginning to change over the course of the story. Hood and his cinematographer Lance Gewer began with one clear idea. They would not use the hand-held style which had been so successful in the worldwide hit that was City of God (Brazil 2002). In that film, hand-held camerawork and fast cutting was an important element in creating an action-packed gangster film. But it wouldn’t be appropriate for Tsotsi. Instead, Hood and Gewer opted for a fairly static camera, carefully framed and lit scenes in which a relatively small and slow zoom in to Tsotsi’s face could communicate agreat deal about what is going on in his head. Tsotsi is a film that ends hanging in mid air. In the version that was shown in cinemas, Tsotsi is holding is arms raised with the three policemen all aiming their guns at him. What happens next? Does Tsotsi surrender? Is his surrender accepted? Or do the police shoot him? It is a tense situation in which anything might happen. 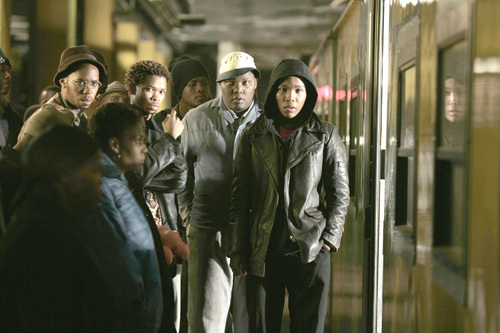 The filmmakers chose this open ending partly because they liked the possibility of audiences leaving the cinema discussing what the ending meant and what should happen to Tsotsi and partly because they had received negative reactions to the other two possibilities that a closed ending would have offered. All three potential endings are shown and discussed by the director on the DVD. Having the police shoot and kill Tsotsi (after he puts his hand in his pocket to bring out the bottle of milk) was thought by some audiences to be too predictable (which might reflect on the status of the police in South Africa), but by others to be emotionally devastating. If an audience invests heavily in a character, especially one who attempts to redeem himself, then the death of the character comes as a blow. The second alternative ending is that the police shoot, but Tsotsi is only wounded. The police seem surprised/shocked that someone has actually fired and in that split second, Tsotsi regains his composure and runs for the wall at the side of the road. He vaults over the wall and heads off across the field, heading for the township. This is the sentimental, romantic ending with the implication that he finds Miriam. But, like the ending in which Tsotsi is killed, the filmmakers felt that this was too ‘pat’ – it meant that there would be no discussion of what should or shouldn’t happen. Whatever sense audiences make of Tsotsi, it will to some extent depend on how they approach the film. This refers to the concept of categorising or classifying films and, based upon the choice of category, developing expectations of what might happen and how it might be presented. Tsotsi is interesting because it doesn’t clearly suggest any single category. Here are some ideas about how audiences might categorise it or select its genre. Tsotsi includes dialogue in Zulu and Xhosa as well as Afrikaans and English (in fact most of the film is conducted in a form of criminal slang). Most of the film is subtitled. In the UK, many audiences claim not to enjoy subtitled films. This may be because they find reading subtitles tiring or because they feel they are missing something else while they are reading. But it is also possible that they may be reacting against what they see as the ‘otherness’ – the strangeness – of non-English language cinema. Partly, they may also associate any subtitled film with the notion of ‘art cinema’ – i.e. that the film will be in some way ‘difficult’ or ‘pretentious’ and may offer a character study more than a good story/plot and action. In many cases they will be justified in this view. Tsotsi is in some ways a character study more than a plot-driven action entertainment feature. However, it certainly isn’t a difficult film. One of the important points about genre as a concept is that the term is used differently by the film industry, audiences, critics and scholars and that each of these groups will themselves use different terms to describe a particular category. On the whole, the film industry uses very broad terms such as comedy, thriller or drama. In fact these are just about the only terms that the industry is happy to use (apart from ‘horror’, which is usually reserved for use with younger audiences). The industry itself is wary of putting any potential audience off by referring to popular genre categories such as science fiction, romance etc. They fear that such terms will deter some audiences. Science fiction films sometimes become ‘futuristic dramas’ and romances become ‘romantic dramas’. What does ‘drama’ mean in these circumstances? Perhaps it simply serves to distinguish one group of films from another group – comedies. Dramas are in some way ‘serious’. Although, of course, you will come across ‘comedy-dramas’. Tsotsi is described as a ‘riveting drama’ on the DVD cover, but there are no other pointers to its generic status. Tsotsi is certainly ‘serious’ in terms of its overall tone and the importance of the social issues it represents. For some audiences, that seriousness will be a kind of status indicator and it may well be associated with the knowledge that the film is based on a novel by a well known playwright. Both literature and theatre have higher cultural status than cinema amongst certain groups in society and a film which has literary roots automatically draws on this status. For other audiences this link might be a disadvantage if they see the film as being ‘stifled’ or restricted by its origins. If we can think about the original author’s intentions without getting bothered about cultural status it could help us in analysing the film’s narrative to think about how the story is constructed in almost theatrical terms. It wouldn’t be difficult to stage Tsotsi as a play. Most of the action takes place in distinctive settings which work as theatrical spaces: Tsotsi’s shack/Miriam’s shack, the shabeen, the train station/underpass, the suburb. There is little use of traditional cinematic devices such as the ‘chase’ which would be difficult to stage. Also the confrontations between characters are also theatrical in terms of dialogue exchange and posed/tableau positioning of actors. The gangster film is a popular form in cinemas across the world, not just in Hollywood films but in films made in Britain, France, Italy, Hong Kong etc. Tsotsi makes clear references to the gangster repertoire with the ‘set-up’ of the attack at the beginning of the film, the squabbling between the gang members, each of whom is typed for easy identification. The development of the story to include a gang leader whose actions are curtailed or re-directed because of a woman (a woman of his own age and/or a mother figure) is also a familiar aspect of the gangster film. However, although the gangster genre may provide many of the elements in the mix, it doesn’t tell the full story and it will be more useful to see Tsotsi as mixing the gangster genre elements with those of the youth picture. •	at the end of the film, the main character will usually have learned something about themselves. Do these elements figure in Tsotsi? The focus of a youth picture narrative will either be something to do with achievement in exams, a job etc. or in a romantic/sexual relationship. Especially in the latter case, this might make the youth picture a ‘coming of age’ story in which the central character is seen to ‘grow up’ in some way. At the beginning of the film, Tsotsi and Miriam pass each other in the crowded streets of the township. The opening to Tsotsi (roughly 5 mins up until the gang leave the train and their victim) performs various tasks which serve to get the narrative started. The first images are close-ups of the craps game with a hand shaking, dice falling on a battered table top, Butcher’s makeshift weapon tapping and cigarette smoke. It is a few moments until we are offered a wide shot allowing us to see that the game is taking place in Tsotsi’s shack while he looks out of the window. This first composition with the four young men together will be repeated in different ways throughout the sequence. The craps game has a double purpose in the narrative. This is a standard ploy in constructing a filmic narrative. First, the game has a narrative function in setting up characters and suggesting what kind of story might develop. Second, it offers a different kind of meaning that we could describe as metaphorical or symbolic. The game introduces the characters quickly and effectively. Aap and Butcher are the players, Aap is certainly typed as the overweight, slightly naive but friendly character up against Butcher who is shown to either cheat or to be innumerate. Either way he is angry and impatient and the tapping of the weapon is a disturbing omen. Boston is similarly typed as the educated onlooker, possibly slightly older. (He reads the paper, he can follow the game without having to concentrate.) Tsotsi at this point is simply ‘apart’ from the others, looking out of the window. There are tensions between the four group members and Butcher is clearly the most provocative of the four. Although he doesn’t say anything, Tsotsi’s physical position and outward look (i.e. away from the game) is significant. But the craps game is also a useful cultural referent. Who plays craps and why? The Wikipedia definition of craps suggests that it is a casino game that can also be played in any setting where men are gathered. In Hollywood movies it is a game often played by soldiers or by petty crooks, both groups wanting something to pass the time between the ‘action’ of combat or crime. In a wider context, the image of young men gambling in this way suggests possibly unemployment, disaffection etc. The other cultural referents in the scene confirm a specific millieu with marijuana on a torn sheet of newspaper, a beer bottle, a footbal team poster on the wall etc. This is the room of a young man. The second type of meaning is metaphorical/symbolic and refers to life as a gamble. Throwing dice can be seen as an approach to decision-making – “let’s see what the dice say”. Alternatively, it could refer to the philosophical position of accepting the consequences of someone else rolling the dice – having to live with whatever the result might be. In either case, the dice game offers the narrative a thematic. Of course, these opening images are accompanied by two other elements: the credits and the use of sound, both the voices of the characters and the music track. The credits are ‘external’ to the fictional world of the film (non-diegetic), but they still offer some clues to the narrative, especially in the presentation of the film’s title. ‘Tsotsi’ is written in a style of calligraphy/typography suggesting the makeshift, the ersatz, possibly the essence of the township. The individual letters were probably typed or printed, but they are of different sizes and weights and they look battered and worn. Together they symbolise the culture rather than directly referring to it. The other noticeable feature of the credits is the light that flickers across the screen, possibly resembling flickering oil lamps and firelight. The graphics and the image help to introduce the location as a township, but to pin down the locale, we need the language and the music. The characters speak in a mixture of languages: Zulu, Xhosa, Afrikaans and English. This mixture is common in many urban areas in the world, but this particular mixture is quite precise and the South African setting is confirmed by the music, the style known as kwaito. Although the rhythm and the overall style of the music is drawn from US and British black music styles (which in their origin are mostly West African), the vocal style of kwaito utilises the uniquely melodic sound of Southern Africa. Like the credits, the kwaito music is non-diegetic. Before we leave this opening scene, we should also note that the sound effects, Butcher’s tapping the rattle of the dice etc. are important in creating some of the tension – much as the smoke rising from Butcher’s cigarette. Buried much lower in the sound mix are the ambient sounds of township life – the low murmur of people on the streets outside, some dogs barking etc. This provides atmosphere and confirms the realist elements of the film’s presentation. But there is also an odd element in the sound mix – two rumbling, rushing sounds, which accompany the throwing of the dice and their landing on the table. We could explain these as rumbles of thunder or other ‘outside’ sounds, but they function in the sequence in conjunction with a visual special effect – the slow motion footage of the dice in flight. The music doesn’t kick in until Tsotsi turns to answer the question about what the gang will do tonight. Tsotsi’s turn leaves him framed by the evening light coming through the window. Lighting is very important in the film. In this sequence it is early evening and the township is bathed in a pinkish glow. Again this is functional and symbolic. The glow as the sun sinks indicates evening (or dawn, the time for other scenes later on) and there is a ‘realist’ explanation for the hazy/misty atmosphere. There is no electricity in the township and many people in the shacks light cooking fires and oil lamps at this time, so the air is always thick. But the overall effect is certainly theatrical – it is rather like the lighting effect in a stage play, especially when it is coupled with the use of small key lamps which direct light onto the faces of the actors and create a kind of ‘halo’ effect. When the gang leave Tsotsi’s shack (which is unusual in being raised above the others, the camera style changes. In the first part of the sequence, it was mostly medium close-ups and close-ups. Now the camera tracks the four as they make their way through the township. There is a variety of shots using a crane and a steadicam. The crane shot will be repeated several times. First it shows long shots of the township (note that Miriam is the first in the queue of women getting water from the standpipe). Next it shows the train approaching the city centre, then the platform to show the arrival of the train with the gang aboard and then the main hall of the station, tilting up sufficiently to allow us to read the large poster which announces that ‘We are all affected by HIV and AIDS’. Again we can read this use of the camera as being both functional and symbolic. It is an economical way of presenting the important locations of the township and the station, both of which are scenes of action and now we have a better sense of their geography. (In the township, the camera also tarcks past the shabeen with a jeering Fela and his gang). The reference to HIV/AIDS is important as it is otherwise not mentioned, despite its central presence in the lives of township dwellers. Did Tsotsi’s mother die of HIV/AIDS? Coupled with the crane shots are various tracking shots – a moving camera follows the gang, sometimes from a low angle and from the front. This makes them appear quite heroic as if marching off to battle. Tsotsi is picked out for close-ups as the leader. When he gives the finger (a borrowed American/European insult?) to Fela, the camera offers us a subjective view of the shabeen (i.e. Tsotsi’s view). Overall, this part of the sequence, which takes the gang to the station, is marked by movement and a flowing camera style – in contrast to the static composition in the shack. As well as Miriam, Morris in his wheelchair is also in this sequence. The crane/long shot will be repeated a little later with a view across the wasteland that separates the township from the suburb – the other main location for the action. In a symbolic sense, the camerawork also establishes that the gang can move through the township and the station as if these are areas that it controls – or at least feels at home in (in contrast to the suburbs). The city centre remain on the horizon, almost like a ‘magic kingdom’ from which the gang are excluded. Later, Tsotsi will sit on the hill outside the city pondering his future. This is a very common image, but nonetheless effective. The next part of the sequence is clearly ‘generic’ in referring to the crime film. We know that a crime is about to take place and it is quickly established by the camera following the swift looks that Tsotsi gives to possible ‘marks’. These are emphasised by whip pans or flashes as Tsotsi turns his attention to someone else. In each case, the possible marks are shown in mid-shot or framed between other figures in the crowd – there are no wide shots, so we are forced to connect, the close-ups of Tsotsi’s face and the images of the marks. When the victim is identified, the camera moves closer to show his transaction with the stallholder and finally the wage packet that he pulls out in order to pay for his purchases. The camerawork and editing are interesting here in showing us that the other gang members are following Tsotsi’s looks and in isolating the figures involved in the final selection by using shallow focus. (This disguises a move from the main hall to the platform, which is obscured by the out of focus background.) Nothing is said in the sequence, but we know precisely what is going on, simply through the use of camera and editing. The gang aboard the train in the opening sequence. At this point it is worth mentioning costume and casting, both important in setting up our feelings towards the crime and towards the gang. In the township we weren’t particularly aware of the four gang members as being distinctive, partly because we didn’t see them in a crowd. Now we recognise that compared to their victim and many others in the station, they are actually quite small in stature, especially Tsotsi. By making the victim both tall and well-built, the stature of the gang members is highlighted. But the victim is also presented as a friendly, trusting man – someone who has possibly just bought a present for a wife or daughter as well as a tie for himself. He has a pleasant exchange with the young Asian woman on the stall and when the gang surround him on the train, he at first looks down on them with an almost avuncular gaze. We have two contrasting ideas here. The gang appear, once in the city, as poor and downtrodden and possibly worthy of our sympathy, but their attack is made to feel even worse by the humanity of the man they select as a victim. When Butcher effectively skewers the man it is a shocking moment. Had Tsotsi intended that the man should die? Was it an accident? Or is Butcher a psychopath who enjoys killing? Like many narratives, Tsotsi attempts to set up an important question in its forst five minutes and almost on cue it does it with the killing. We have spent five minutes getting to know these characters – what have we let ouselves in for? What kind of story will follow? Like the scenes in the main hall of the station, most of the scenes in the train are framed in mid-shot or medium close-up. The action moves quickly and the soundtrack again uses ambient sound and what might be sound effects to emphasise the way Tsotsi homes in on the victim. The final shot in the sequence is a wider shot of the empty carriage with the body on the floor. This is both a symbolic corpse – an unnecessary death to haunt Tsotsi – and another indicator of the realism of a story set in a country with one of the worst records for violent crime in the world. The opening sequence ends here, having established the characters of the four gang members and introduced the ‘inciting incident’ as some theorists call it. The killing acts to set off a chain of events, beginning in the shabeen where Boston’s disgust pushes Tsotsi into an outburst. 1. How do you relate to Tsotsi as a character? Does your attitude towards him change over the course of the narrative? 2. What do you make of the ending of the film? Do you like being given the opportunity to decide what should happen to him or would you rather be given a clear indication? 3. The presence of Boston, ‘the teacher’, in the gang is not properly explained in the film, but he performs an important role in driving Tsotsi into action. More background on this is given in the deleted scene on the DVD. Do you think the director was right to cut this scene? What difference would its inclusion make? 4. Tsotsi has been seen around the world and it won the Oscar for Best Foreign Language Picture in 2006. As a consequence of this exposure, Presley Chweneyagae who plays Tsotsi has become a star in South Africa. What kinds of star qualities do you think he has and which aspects of his performance make his portrayal of Tsotsi so compelling? 5. Terry Pheto, who plays Miriam, is the other potential star performer in the film. Miriam is a difficult role to play since women in South African society (and also in South African cinema) are at best marginalised. What kind of woman is Terry Pheto able to represent in Tsotsi and how would you explain the character’s actions in the film? 6. Various categories or genres are suggested as possible for Tsotsi in these notes. Which of them do you find most useful? How did you approach the film? Which other films have you seen which are in some way comparable with Tsotsi? 7. To what extent do you think Tsotsi is a ‘realist’ film, depicting life in the townships today? Which scenes would you pick out as being less ‘realist’ and more like a stage play, with exaggerated use of colour and setting? 8. If we consider the film to be more about symbolism and metaphor, a common theme running throughout the film is about ‘parenting’. Can you list all the ‘real’ and ‘symbolic’ mothers, fathers and children in the film? What might the film be saying about families? 9. The narrative focuses almost completely on the story of Tsotsi. Even so, there are ideas expressed about the current state of South African society in a broader sense. Think about the interaction between the police, the middle class suburban couple and the people in the townships. What do these interactions suggest about contemporary South Africa? 10. As well as being about South Africa, the story in Tsotsi also has ‘universal elements’ which could be utilised in a film set anywhere in the world. How would you identify these universal elements and how would you use them in a film made in the UK or anywhere else that you know? 11. The tragedy of HIV/AIDS is there in the background of Tsotsi and, although not explicitly stated, it seems likely that it killed Tsotsi’s mother. Why do you think the filmmakers kept it so far in the background? How would the story change if HIV/AIDS came into the foreground? 12. There is no obvious ‘villain’ in the story of Tsotsi – i.e. in the form of a single character. Without such a character how does the film handle the development of conflict and the final climax in the narrative? This entry was posted in African Cinema and tagged youth picture. Bookmark the permalink.